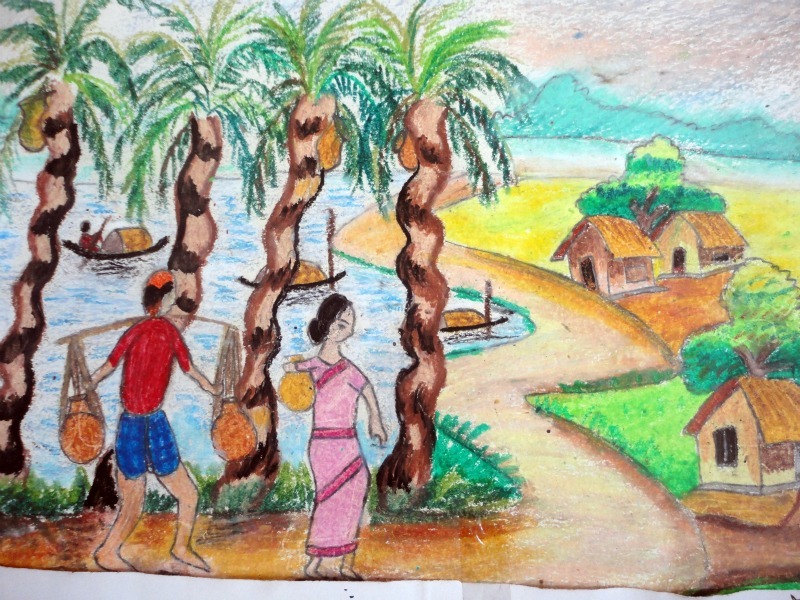 These sample art work from students at Rajuk Uttara Model School (RUMS) illustrate that a common theme to showcase in classroom art work are scenes of the Bangladeshi village. 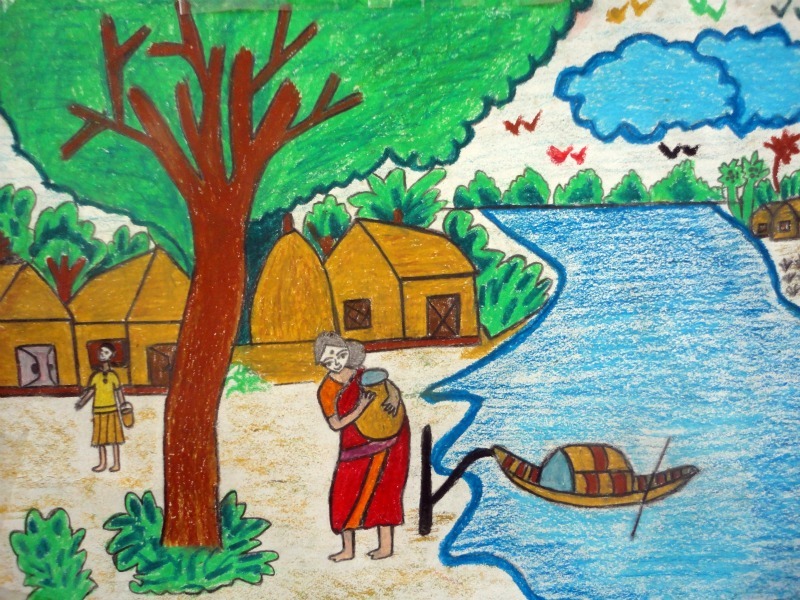 Huts, rice patties, hills, rivers, boats, and figures in traditonal clothing are some of the most common subjects present in art by students from all grade levels. They are usually drawn with crayons or water colors, and are usually very bright and vibrant on paper. The second most popular theme is the revolutionary war of 1971. Abstract art was not included in any of the samples I had a chance to see. The village theme’s popularity in children’s art is interesting because almost all of the students at RUMS were born and raised in the city. Additionally, increasinly it can be observed that the parents of 1990s children were also raised in Dhaka. 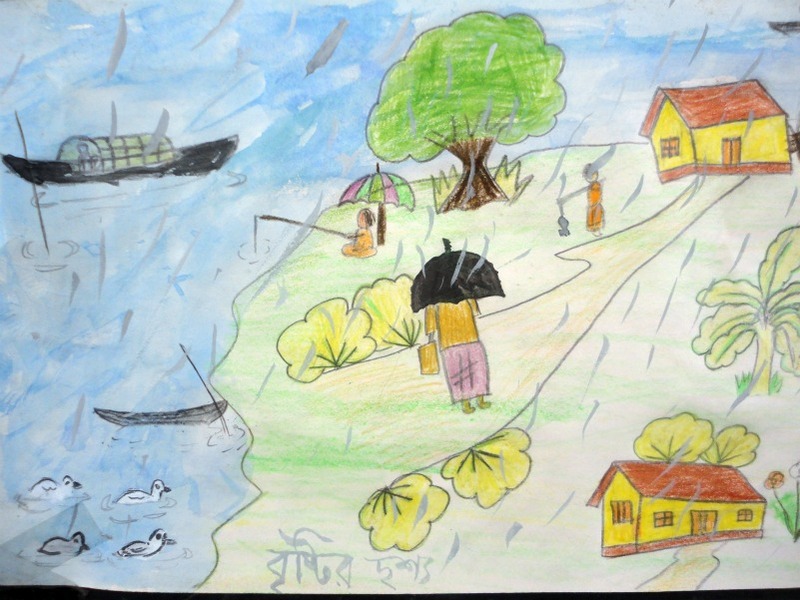 Thus one must wonder why villages become a repeated topic in art since the village scene is so different from that of Dhaka city. One student told me that they are asked to draw “something beautiful” in their art class and that usually resonates the village scene. 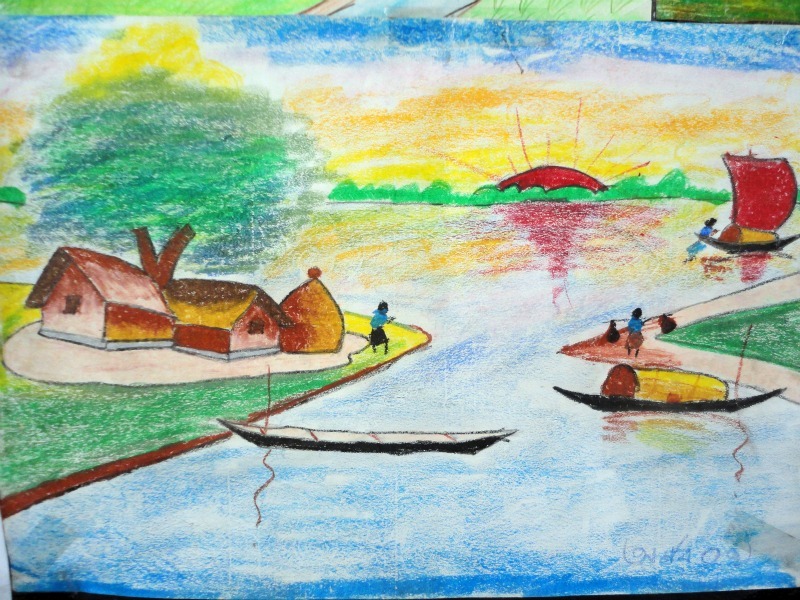 He explained that the village is more calm, quiet, and shows “natural beauty” that is present in most of Bangladesh but not in the city. Thus, being told to draw something beautiful meant drawing something outside the city. Another student told me that often art class means drawing what the teacher tells you to, and what the teacher wants to see. These teachers will often assign the drawing of village scenes, and this initial teaching sticks to the children afterwards. In order to get the grade, you have to please the instructor, who has made his or her desire for such themes apparent. These teachers are also more likely to be more connected to the village than their students in Dhaka. This logic follows for art competitions as well where to win, drawing the most splendid scenaries does the trick. Village scenes represents a certain nostalgia for what is missing in the city- cleaner air, people not in hurry, landscapes void of clumped together buildings, trees without the residue of pollution, and such. 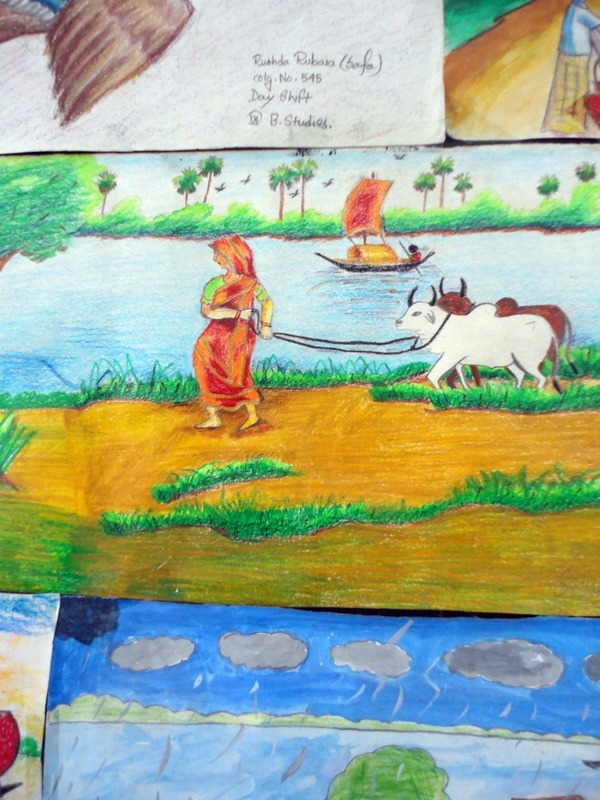 These scenes as represented by children of the city in school art classes showcase a divide of the urban and rural. It also works in an interesting way to connectgenerations widely different in history, lifestyle, and mobility. 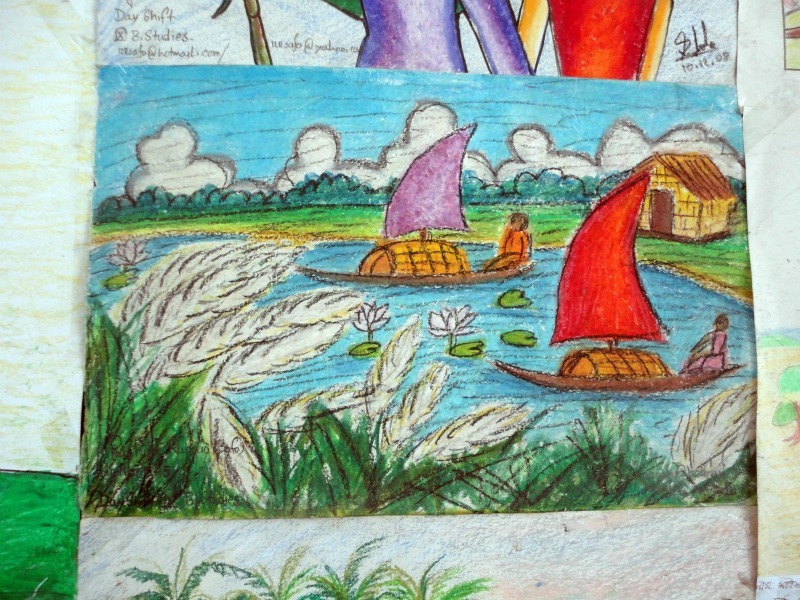 Being interested in art, it was really great to read your blog no matter I am a bit hopeless that one day Bangladesh will come out of these art practice. sooner or later, these kids will do interior, design their own buildings or shops, make signs, posters and thus city scape will look like. if the sense of art is not cultured, how will a city look clean and nice? Are you living in Uttara? How do you think that art should be cultured as you state? I think that teachers have a responsibility of encouraging students to draw whatever they want or envision and additionally emphasize that they all do not have to draw the same thing; there is no such thing as the “right” or “wrong” subject to draw. Art is not about that. In a broader sense, the idea of individuality must be emphasized in this day and age. P.S. No, I don’t live in Uttara, but work there. this is very useful for my brother’s painting competition. and for that i invite you today’s night to spend a romantic night with me. i you really love me you have to come [i already make all arrangement]. today i cross all limits to touch you, to make you dressless. come at 10 o’ clock …………………. Great Arts! Thanks for posting them.